Lela Garner Kelt's tombstone, New Cemetery, Chatfield, Tex., courtesy of Mary H. Shearer. [S961] Find A Grave, online at http://www.findagrave.com, memorial for Lela Sarah Garner Kelt, memorial no. 30926346, viewed on 24 Jul 2011 (naming William Ceberry Garner as her father). [S961] Find A Grave, online, above, memorial for Lela Sarah Garner Kelt, memorial no. 30926346, viewed on 24 Jul 2011. [S80] Elizabeth Phillips, Elizabeth Kelt, and "Bud" Kelt, "Kelt Family," in Navarro County History, vol. 2 (Corsicana, Tex. : The Navarro County Hist. Soc'y, 1978), pp. 208-09, (giving her name as Lela Garner and giving only the year). [S783] Ron Whitehead, electronic mail to Roger Bartlett, 25 Oct 2002, (giving her name as Lela). [S961] Find A Grave, online, above, memorial for Lela Sarah Garner Kelt, memorial no. 30926346, viewed on 24 Jul 2011 (not giving the date). [S961] Find A Grave, online, above, memorial for Julius Julian ('Jules') Kelt, memorial no. 30926385, viewed on 24 Jul 2011 (not giving the date). [S11] Index to Texas Death Records (Austin, Tex. : Tex. Dept. of Health, Bur. of Vital Statistics), typescript, 1964-1988 (microfiche), p. 22788, file 13883-68 (giving the date and county but not the city. [S796] Navarro County Cemetery Records, vol. 7, above, New Chatfield Cemetery survey, p. 4 (giving the date but not naming the place). [S796] Navarro County Cemetery Records, vol. 7, above, New Chatfield Cemetery survey, p. 4 (common marker with Jules J. Kelt) (not giving the date). [S80] Elizabeth Phillips, et al., "Kelt Family," above, (naming Lela Garner as his mother). Jules Kelt's campaign photo, date unknown. Obituary*: Funeral services were to be held at 4 p.m. today at the Corley Funeral Home Chapel for Jules J. Kelt Sr., 87, resident of Chatfield, who died Wednesday at Evergreen Nursing Home. Rev. Walter Neil Marcum was to officiate, with burial to be at New Chatfield Cemetery. [S5] Kellie Loop, Rice, Tex., miscellaneous papers, p. 15 (stating that he was born on 24 Oct 1886 without naming the place). Miss Loop collected family data for decades, probably from the 1930s to the 1970s. Some of it is in her handwriting, and much of it appears to have been written by others and sent to her, but very little of it contains source attribution. There are inconsistencies within the papers. In 1974 the papers were in the possession of Roger Bartlett, Austin, Tex., who assigned the page numbers for ease of reference. [S312] Social Security Death Index, online at http://tinyurl.com/AncestrySSDI, viewed on 9 Mar 1998 (giving his name as Julius Kelt and stating that he was born on 24 Oct 1886 without naming the place). [S796] Navarro County Cemetery Records, vol. 7 (Corsicana, Tex. : The Navarro County Gen. Soc'y, 1987), New Chatfield Cemetery survey, p. 4 (misstating the date as 24 Oct 1996 and not naming the place). [S961] Find A Grave, online at http://www.findagrave.com, memorial for Julius Julian ('Jules') Kelt, memorial no. 30926385, viewed on 24 Jul 2011 (giving the date but not the place). [S80] Elizabeth Phillips, et al., "Kelt Family," above, (giving her name as Lela Garner and giving only the year). [S11] Index to Texas Death Records (Austin, Tex. : Tex. Dept. of Health, Bur. of Vital Statistics), typescript, 1974, vol. 2, p. 887, file 60809 (stating that he died on 21 Aug 1974 in Navarro Co., Tex. without naming the town). [S312] Social Security Death Index, online at http://tinyurl.com/AncestrySSDI, viewed on 9 Mar 1998 (giving his name as Julius Kelt; stating that he died in Aug 1974; not naming the place of death but stating that he lived in Chatfield, Tex. when he died). [S961] Find A Grave, online, above, memorial for Julius Julian ('Jules') Kelt Sr., memorial no. 30926385, viewed on 24 Jul 2011 (giving the date but not the place). [S1207] Corsicana Daily Sun, Corsicana, Tex., online archive at http://corsicana.newspaperarchive.com, 16 Aug 1974, p. 2 (reprinted here with consent of the Corsicana Daily Sun) (obituary of J. J. Kelt). [S796] Navarro County Cemetery Records, vol. 7, above, New Chatfield Cemetery survey, p. 4 (common marker with Lela G. Kelt) (giving the place but not the date). [S961] Find A Grave, online, above, memorial for Julius Julian ('Jules') Kelt, memorial no. 30926385, viewed on 24 Jul 2011 (giving the place but not the date). [S1207] Corsicana Daily Sun, Corsicana, Tex., online archive, above, 16 Aug 1974, p. 2 (reprinted here with consent of the Corsicana Daily Sun). Funeral card for George Allen Kelt. Services will be 3:30 p.m. Wednesday at the Corley Funeral Chapel for George Allen Kelt, 65, of Chatfield, who died Monday at Memorial Hospital. The Rev. Pat Whitmore will officiate with burial at the Chatfield Cemetery. He was a retired district sales manager for Olin Chemical Co., a member of the Chatfield Methodist Church, a veteran of World War II and a native of New Mexico. [S8] Corsicana Daily Sun, Corsicana, Tex., 19 Apr 1977, p. 2 (obituary of George Allen Kelt, stating that he was sixty-five years old when he died on 18 Apr 1977 and that he was a native of New Mexico). [S11] Index to Texas Death Records (Austin, Tex. : Tex. Dept. of Health, Bur. of Vital Statistics), typescript, 1964-88 (microfiche), p. 22788, file 37851-77 (includes birth date). [S961] Find A Grave, online at http://www.findagrave.com, memorial for George Allen Kelt, memorial no. 69711719, viewed on 29 Feb 2012 (giving the date but no other information). [S80] Elizabeth Phillips, et al., "Kelt Family," above, (spelling her last name as Brasell and not giving the date). [S8] Corsicana Daily Sun, Corsicana, Tex., 19 Apr 1977, p. 2 (obituary of George Allen Kelt). [S11] Index to Texas Death Records, typescript, above, 1964-88 (microfiche), p. 22788, file 37851-77. [S312] Social Security Death Index, online at http://tinyurl.com/AncestrySSDI, viewed on 9 Mar 1998 (stating that he died in Apr 1977; not naming the place of death but stating that he lived in Chatfield, Texas when he died). [S458] Funeral card, George Allen Kelt, prepared by Corley Funeral Home, Corsicana, Tex. (giving the date but not naming the place). 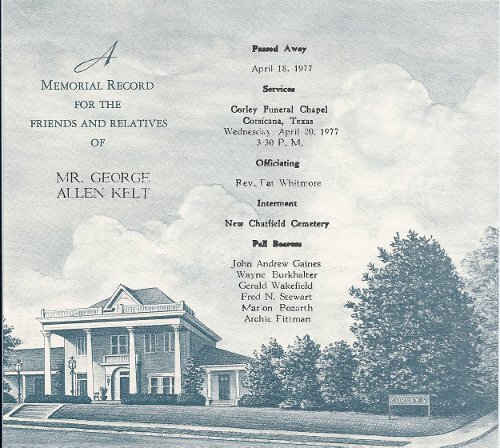 [S458] Funeral card, George Allen Kelt, prepared by Corley Funeral Home, Corsicana, Tex. [S796] Navarro County Cemetery Records, vol. 7, above, New Chatfield Cemetery survey, p. 4 (naming the cemetery without giving the date) (common stone with Elizabeth Louise Kelt). [S961] Find A Grave, online, above, memorial for George Allen Kelt, memorial no. 69711719, viewed on 29 Feb 2012 (not giving the date). [S8] Corsicana Daily Sun, Corsicana, Tex., 19 Apr 1977, p. 2 (giving his name as G. A. Kelt). [S8] Corsicana Daily Sun, Corsicana, Tex., 19 Apr 1977, p. 2 (reprinted here with consent of the Corsicana Daily Sun). Elizabeth Louise Braswell Kelt's tombstone, New Cemetery, Chatfield, Tex., courtesy of Mary H. Shearer. Other Names*: Elizabeth Braswell, Elizabeth Louise Braswell Kelt, Elizabeth Louise Kelt, Elizabeth Braswell Kelt, Elizabeth Kelt. [S312] Social Security Death Index, online at http://tinyurl.com/AncestrySSDI, viewed on 27 Aug 1998. [S961] Find A Grave, online at http://www.findagrave.com, memorial for Elizabeth Louise Kelt, memorial no. 69711576, viewed on 29 Feb 2012. [S80] Elizabeth Phillips, Elizabeth Kelt, and "Bud" Kelt, "Kelt Family," in Navarro County History, vol. 2 (Corsicana, Tex. : The Navarro County Hist. Soc'y, 1978), pp. 208-09, (spelling her last name as Brasell and not giving the date). [S267] Dorothy Bartlett, Rice, Tex., telephone conversation with Roger Bartlett, 8 Feb 1998 (stating that she died in early February in Houston, Texas). [S312] Social Security Death Index, online at http://tinyurl.com/AncestrySSDI, viewed on 27 Aug 1998 (not naming the place of death but stating that she lived in New Ulm, Tex. when she died). [S961] Find A Grave, online, above, memorial for Elizabeth Louise Kelt, memorial no. 69711576, viewed on 29 Feb 2012 (giving the date but no other information). [S267] Dorothy Bartlett, Rice, Tex., telephone conversation with Roger Bartlett, 8 Feb 1998. [S796] Navarro County Cemetery Records, vol. 7, above, New Chatfield Cemetery survey, p. 4 (naming the cemetery without giving the date) (common stone with George Allen Kelt). [S961] Find A Grave, online, above, memorial for Elizabeth Louise Kelt, memorial no. 69711576, viewed on 29 Feb 2012 (not giving the date). [S137] Index to Texas Delayed Probate Birth Records (Austin, Tex. : Tex. Dept. of Health, Bur. of Vital Statistics), vol. 20, p. 9606, file 220944 (giving his first name as Julius). [S312] Social Security Death Index, online at http://tinyurl.com/AncestrySSDI, viewed on 9 Mar 1998 (giving his name as Julius and giving only the date). [S11] Index to Texas Death Records (Austin, Tex. : Tex. Dept. of Health, Bur. of Vital Statistics), typescript, 1989 (microfiche), p. 1107, file 66831. [S312] Social Security Death Index, online at http://tinyurl.com/AncestrySSDI, viewed on 9 Mar 1998 (giving his name as Julius; not naming the place of death but stating that he lived in Corsicana, Texas when he died). [S5] Kellie Loop, miscellaneous papers, above p. 15 (stating that he and his first wife were married on 12 Jan 1950 and had three children). [S267] Dorothy Bartlett, Rice, Tex., telephone conversation with Roger Bartlett, 8 Feb 1998 (stating that his wife shot him). [S961] Find A Grave, online at http://www.findagrave.com, memorial for William Lorwery (sic) Garner, memorial no. 69330283, viewed on 24 Jul 2011 (naming William Ceberry Garner as his father). [S796] Navarro County Cemetery Records, vol. 7 (Corsicana, Tex. : The Navarro County Gen. Soc'y, 1987), New Chatfield Cemetery survey, p. 10 (stating that he was born in 1890). [S961] Find A Grave, online, above, memorial for William Lorwery (sic) Garner, memorial no. 69330283, viewed on 24 Jul 2011. [S961] Find A Grave, online, above, memorial for Bertha Garner Garner, memorial no. 69330505, viewed on 24 Jul 2011 (not giving the date). [S961] Find A Grave, online, above, memorial for William Lorwery (sic) Garner, memorial no. 69330283, viewed on 24 Jul 2011 (not giving the date). [S11] Index to Texas Death Records (Austin, Tex. : Tex. Dept. of Health, Bur. of Vital Statistics), typescript, 1968, vol. 2, p. 528, file 37183. [S312] Social Security Death Index, online at http://tinyurl.com/AncestrySSDI, viewed on 9 Mar 1998 (stating that he died in May 1968; not naming the place of death but stating that he lived in Corsicana, Texas when he died). [S796] Navarro County Cemetery Records, vol. 7, above, New Chatfield Cemetery survey, p. 10 (stating that he died in 1968 without naming the place). [S796] Navarro County Cemetery Records, vol. 7, above, New Chatfield Cemetery survey, p. 10 (common marker with Bertha Garner). Bertha Garner's tombstone, New Cemetery, Chatfield, Tex., courtesy of Mary H. Shearer. [S796] Navarro County Cemetery Records, vol. 7 (Corsicana, Tex. : The Navarro County Gen. Soc'y, 1987), New Chatfield Cemetery survey, p. 10 (stating that she was born in 1896). [S961] Find A Grave, online at http://www.findagrave.com, memorial for Bertha Garner Garner, memorial no. 69330505, viewed on 24 Jul 2011 (giving the year but no other details). [S8] Corsicana Daily Sun, Corsicana, Tex., 25 Mar 1976. [S11] Index to Texas Death Records (Austin, Tex. : Tex. Dept. of Health, Bur. of Vital Statistics), typescript, 1976, vol. 2, p. 571, file 22756. [S312] Social Security Death Index, online at http://tinyurl.com/AncestrySSDI, viewed on 9 Mar 1998 (stating that she died in Mar 1976; not naming the place of death but stating that she lived in Corsicana, Texas when she died). [S796] Navarro County Cemetery Records, vol. 7, above, New Chatfield Cemetery survey, p. 10 (stating that she died in 1976 without naming the place). [S961] Find A Grave, online, above, memorial for Bertha Garner Garner, memorial no. 69330505, viewed on 24 Jul 2011 (giving the date but not the place). [S796] Navarro County Cemetery Records, vol. 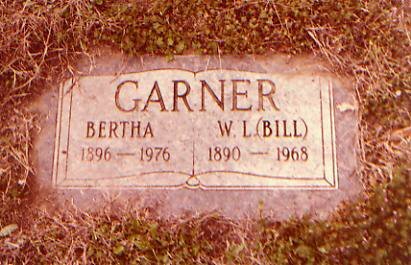 7, above, New Chatfield Cemetery survey, p. 10 (common marker with W. L. ['Bill'] Garner). [S961] Find A Grave, online, above, memorial for Bertha Garner Garner, memorial no. 69330505, viewed on 24 Jul 2011. [S312] Social Security Death Index, online at http://tinyurl.com/AncestrySSDI, viewed on 13 Mar 1998. [S11] Index to Texas Death Records (Austin, Tex. : Tex. Dept. of Health, Bur. of Vital Statistics), typescript, 1964-1988 (microfiche), p. 18498, file 45270-77 (birth and death). [S312] Social Security Death Index, online at http://tinyurl.com/AncestrySSDI, viewed on 13 Mar 1998 (stating that he died in Jun 1977; not naming the place of death but stating that he lived in Barry, Texas when he died). [S312] Social Security Death Index, online at http://tinyurl.com/AncestrySSDI, viewed on 1 Apr 1998 (giving his name as A. Richards). [S312] Social Security Death Index, online at http://tinyurl.com/AncestrySSDI, viewed on 1 Apr 1998 (giving his name as A. Richards; not naming the place of death but stating that he lived in Dallas, Texas when he died). "Services were at 3:30 p.m. Saturday at the Corley Funeral Home Chapel for Orvel Glenn, 57, resident of Corsicana, who died Friday in Memorial Hospital. "The Rev. David Hale officiated and burial followed at Oakwood Cemetery. "He was a native of Antlers, Okla., veteran of World War II, a member of the Baptist church and owner and operator of the Glenn Exxon Service Station, South 15th St. and West Seventh. "Survivors include his widow, Mrs. Kathleen Glenn of Corsicana; a son, Orvel Dale Glenn of Corsicana; two daughters, Mrs. Lexie Hutchison of San Antonio and Mrs. Janis Kelly of Dallas; five grandchildren, and a sister, Mrs. H. T. Bassham of Corsicana. Note*: • He served in the U.S. Army in World War II. • He was a member of the Baptist Church. [S190] Navarro County Cemetery Records, vol. 10 (Corsicana, Tex. : The Navarro County Gen. Soc'y, 1990), p. 19 (spelling his name as Glen) (giving the date but not the place). [S312] Social Security Death Index, online at http://tinyurl.com/AncestrySSDI, viewed on 11 Mar 1998 (giving the date but not the place). 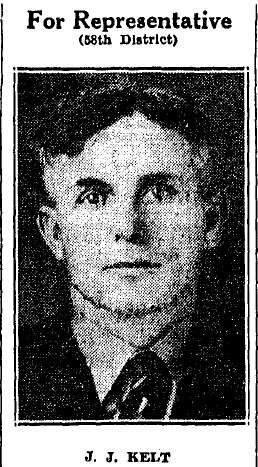 [S1307] Corsicana Weekly Light, Corsicana, Tex., online archive at http://www.newspapers.com, 17 Feb 1977, p. 3, col. 8 (not giving the date but stating he was a native of Antlers, Oklahoma) (obituary of Orvel Glenn) (reprinted here with consent of the Corsicana Daily Sun, successor to the Corsicana Weekly Light). [S961] Find A Grave, online at http://www.findagrave.com, memorial for Orvel W. Glenn, memorial no. 125826077, viewed on 1 Nov 2015 (giving the date but not the place). [S11] Index to Texas Death Records (Austin, Tex. : Tex. Dept. of Health, Bur. of Vital Statistics), typescript, 1977 (microfiche), p. 608, file 12345-77. [S190] Navarro County Cemetery Records, vol. 10, above, p. 19 (spelling his name as Glen and giving only the date). [S312] Social Security Death Index, online at http://tinyurl.com/AncestrySSDI, viewed on 11 Mar 1998 (stating that he died in Feb 1977; not naming the place of death but stating that he lived in Corsicana, Texas when he died). [S1307] Corsicana Weekly Light, Corsicana, Tex., online archive, above, 17 Feb 1977, p. 3, col. 8 (obituary of Orvel Glenn) (reprinted here with consent of the Corsicana Daily Sun, successor to the Corsicana Weekly Light). [S190] Navarro County Cemetery Records, vol. 10, above, p. 19 (spelling his name as Glen). [S1307] Corsicana Weekly Light, Corsicana, Tex., online archive, above, 17 Feb 1977, p. 3, col. 8 (reprinted here with consent of the Corsicana Daily Sun, successor to the Corsicana Weekly Light). [S190] Navarro County Cemetery Records, vol. 10, above, p. 19 (spelling his name as Glen) (first bullet). [S1307] Corsicana Weekly Light, Corsicana, Tex., online archive, above, 17 Feb 1977, p. 3, col. 8 (stating that he was a veteran of World War II) (obituary of Orvel Glenn) (reprinted here with consent of the Corsicana Daily Sun, successor to the Corsicana Weekly Light) (first bullet). [S1307] Corsicana Weekly Light, Corsicana, Tex., online archive, above, 17 Feb 1977, p. 3, col. 8 (obituary of Orvel Glenn) (reprinted here with consent of the Corsicana Daily Sun, successor to the Corsicana Weekly Light) (second bullet). [S1307] Corsicana Weekly Light, Corsicana, Tex., online archive, above, 17 Feb 1977, p. 3, col. 8 (obituary of Orvel Glenn) (reprinted here with consent of the Corsicana Daily Sun, successor to the Corsicana Weekly Light) (third bullet). [S961] Find A Grave, online, above, memorial for Orvel W. Glenn, memorial no. 125826077, viewed on 1 Nov 2015 (first bullet). [S5] Kellie Loop, Rice, Tex., miscellaneous papers, p. 15 (giving only the date). Miss Loop collected family data for decades, probably from the 1930s to the 1970s. Some of it is in her handwriting, and much of it appears to have been written by others and sent to her, but very little of it contains source attribution. There are inconsistencies within the papers. In 1974 the papers were in the possession of Roger Bartlett, Austin, Tex., who assigned the page numbers for ease of reference. [S58] Index to Texas Birth Records (Austin, Tex. : Tex. Dept. of Health, Bur. of Vital Statistics), typescript 1924, vol. 2, p. 543, file 53816. [S312] Social Security Death Index, online at http://tinyurl.com/AncestrySSDI, viewed on 11 Mar 1998 (not naming the place of death but stating that he lived in Hobbs, New Mexico when he died). [S5] Kellie Loop, miscellaneous papers, above p. 15 (stating that they had two children). [S5] Kellie Loop, Rice, Tex., miscellaneous papers, p. 3 (giving his name as Bruce Oliphant and naming William Landon Oliphant as his father). Miss Loop collected family data for decades, probably from the 1930s to the 1970s. Some of it is in her handwriting, and much of it appears to have been written by others and sent to her, but very little of it contains source attribution. There are inconsistencies within the papers. In 1974 the papers were in the possession of Roger Bartlett, Austin, Tex., who assigned the page numbers for ease of reference. [S5] Kellie Loop, miscellaneous papers, above pp. 3, 16 (giving his name as Bruce Oliphant). [S733] Francie Herring, family group sheet provided to Roger Bartlett, 27 Mar 2002 (giving his name as William Bruce Oliphant). [S5] Kellie Loop, miscellaneous papers, above p. 3 (naming Bruce Oliphant as her father). [S5] Kellie Loop, Rice, Tex., miscellaneous papers, p. 3 (naming Bruce Oliphant as her father). Miss Loop collected family data for decades, probably from the 1930s to the 1970s. Some of it is in her handwriting, and much of it appears to have been written by others and sent to her, but very little of it contains source attribution. There are inconsistencies within the papers. In 1974 the papers were in the possession of Roger Bartlett, Austin, Tex., who assigned the page numbers for ease of reference. [S5] Kellie Loop, miscellaneous papers, above pp. 3, 16. [S312] Social Security Death Index, online at http://tinyurl.com/AncestrySSDI, viewed on 30 Mar 1998. [S312] Social Security Death Index, online at http://tinyurl.com/AncestrySSDI, viewed on 30 Mar 1998 (not naming the place of death but stating that he lived in Burleson, Texas when he died). [S312] Social Security Death Index, online at http://tinyurl.com/AncestrySSDI, viewed on 30 Mar 1998 (not naming the place of death but stating that she lived in Santa Barbara, California when she died). Sarah Blanche Oliphant Hervey's tombstone, Old Cemetery, Chatfield, Tex. Other Names*: Blanche Oliphant, Sarah Blanche Oliphant Hervey, Sarah Blanche Hervey, Blanche Hervey. [S5] Kellie Loop, Rice, Tex., miscellaneous papers, p. 3 (naming William Landon Oliphant as her father). Miss Loop collected family data for decades, probably from the 1930s to the 1970s. Some of it is in her handwriting, and much of it appears to have been written by others and sent to her, but very little of it contains source attribution. There are inconsistencies within the papers. In 1974 the papers were in the possession of Roger Bartlett, Austin, Tex., who assigned the page numbers for ease of reference. [S5] Kellie Loop, miscellaneous papers, above pp. 10, 16. [S153] Navarro County Cemetery Records, vol. 3 (Corsicana, Tex. : The Navarro County Gen. Soc'y, 1984), p. 24 (giving the date but no other information). [S733] Francie Herring, family group sheet provided to Roger Bartlett, 27 Mar 2002 (giving the date but no other information). 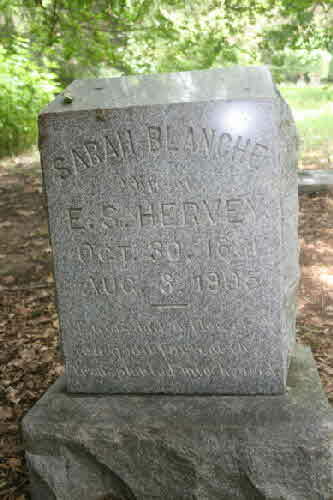 [S961] Find A Grave, online at http://www.findagrave.com, memorial for Sarah Blanche Oliphant Hervey, memorial no. 30294661, viewed on 3 Jul 2011. [S31] Navarro Leaves and Branches, vol. XII, no. IV (Nov 1989), p. 10 (giving her name as Blanche Oliphant and citing Navarro County, Tex. Marriage Records, bk. XII, p. 284). [S733] Francie Herring, 27 Mar 2002 family group sheet, above. [S153] Navarro County Cemetery Records, vol. 3, above, p. 24. [S961] Find A Grave, online, above, memorial for Sarah Blanche Oliphant Hervey, memorial no. 30294661, viewed on 13 Sep 2011. [S5] Kellie Loop, miscellaneous papers, above p. 3 (naming Blanche Oliphant as her mother). [S443] Will of William W. Loop, dated 4 Nov 1910, Navarro Co., Tex. Probate Minutes, bk. 26, pp. 360-65,(naming Irene Hervey as great-grandchild of William W. Loop). [S961] Find A Grave, online at http://www.findagrave.com, memorial for Edgar Shepard Hervey, memorial no. 13070733, viewed on 8 Jul 2012. [S5] Kellie Loop, Rice, Tex., miscellaneous papers, pp. 10, 16. Miss Loop collected family data for decades, probably from the 1930s to the 1970s. Some of it is in her handwriting, and much of it appears to have been written by others and sent to her, but very little of it contains source attribution. There are inconsistencies within the papers. In 1974 the papers were in the possession of Roger Bartlett, Austin, Tex., who assigned the page numbers for ease of reference. [S5] Kellie Loop, miscellaneous papers, above p. 3 (naming Ed. Hervey as her father). Other Names*: Irene Hervey, Malissa Irene Hervey, Melissa Irene Claycomb, Malissa Irene Claycomb, Irene Claycomb. [S5] Kellie Loop, Rice, Tex., miscellaneous papers, p. 3 (naming Ed. Hervey as her father). Miss Loop collected family data for decades, probably from the 1930s to the 1970s. Some of it is in her handwriting, and much of it appears to have been written by others and sent to her, but very little of it contains source attribution. There are inconsistencies within the papers. In 1974 the papers were in the possession of Roger Bartlett, Austin, Tex., who assigned the page numbers for ease of reference. [S5] Kellie Loop, miscellaneous papers, above pp. 3 (date only), 10, 16. [S961] Find A Grave, online at http://www.findagrave.com, memorial for Irene Rollman Claycomb, memorial no. 131446235, viewed on 1 Dec 2014 (giving the year but no other information). [S5] Kellie Loop, miscellaneous papers, above pp. 3 (not giving the date or place), 10, 16. [S961] Find A Grave, online, above, memorial for Irene Rollman Claycomb, memorial no. 131446235, viewed on 1 Dec 2014. [S5] Kellie Loop, miscellaneous papers, above p. 3. [S5] Kellie Loop, miscellaneous papers, above p. 10 (naming Malissa Irene Hervey as his mother). [S961] Find A Grave, online at http://www.findagrave.com, memorial for Roy Robert Claycomb, memorial no. 131446360, viewed on 1 Dec 2014 (giving the year but no other information). [S961] Find A Grave, online, above, memorial for Roy Robert Claycomb, memorial no. 131446360, viewed on 1 Dec 2014. [S5] Kellie Loop, miscellaneous papers, above p. 10 (naming Roy Robert Claycomb as his father). Other Names*: Rosella Claycomb Mitchell, Rosella Mitchell, Rosella Claycomb Ogg, Rosella Mitchell Ogg, Rosella Ogg. [S5] Kellie Loop, miscellaneous papers, above p. 10 (naming Rosella Claycomb as his mother). [S961] Find A Grave, online at http://www.findagrave.com, memorial for Roy Lee Mitchell, memorial no. 84935992, viewed on 1 Dec 2014 (naming Rosella Claycomb as his mother).